Some people just adore little dogs that they can carry around. Others love majestic giant dog breeds best. What if your tastes lie somewhere in the middle? You might be a fan of medium-sized dogs. Neither too big nor too small, they are what many consider "just right." These versatile dogs usually possess some traits of both small and large dogs. What defines a medium-sized dog? It depends who you ask. Small dog breeds tend to go up to about 20 pounds. Large dog breeds begin around 60 pounds. Some organizations break down dog sizes into detailed groups (eg: extra-small, small, small-medium, medium, medium-large, large, extra-large, and giant). To keep it simple, let's look at popular breeds that fall between small and large. These breeds will range in average size from about 25 to 55 pounds. Because of this wide weight range, medium-sized dogs make up a large portion of the dog breeds out there. Those who prefer medium-sized dogs love that they are small enough to fit in smaller spaces but large enough to play like a "big dog." There are also some potential advantages to having a medium-sized dog. They are not underfoot and fragile like some small dogs. Yet they often have longer lifespans and fewer orthopedic issues than large dogs. No two dogs are exactly the same. A dog's breed should not be the only deciding factor when choosing a dog. While the breed can give you a general idea of what to expect, it's also important to consider the individual dog's personality, temperament, energy level, and trainability. Have you got your heart set on a medium-sized dog? Fortunately, there are a great number of popular and beloved medium-sized dog breeds to choose from. Before you look for a specific dog breed, consider adopting a mixed-breed dog. Each mutt is a one-of-a-kind dog. Mixed-breed dogs come in all sizes, especially medium. 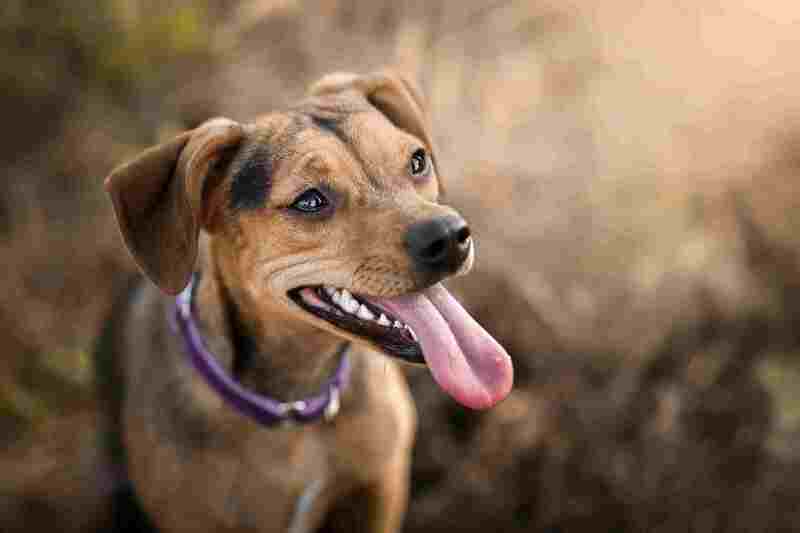 In many cases, mixed-breed dogs are healthy, smart, and friendly. By adopting a mutt, you would be providing a home for a dog that might otherwise end up euthanized due to pet overpopulation. You can find the right mixed-breed dog for you by visiting local animal shelters and pet rescue groups. Shelter/rescue workers can often give you a general idea of the dog's personality and needs. Once you meet the dog, you can get a sense of these traits as well. However, a dog may act differently in the shelter than in a home. Consider choosing an organization that has a fostering program so you can find out more about the dog's behavior in a home environment. Talk to foster owners about each dog's personality, temperament, energy level, and trainability. The American Staffordshire Terrier, or "Am Staff" is very similar to the American Pit Bull Terrier and is often casually called a pit bull. Unfortunately, pit bull type dogs are often very misunderstood. Some jurisdictions actually have legislation banning American Staffordshire Terriers and any dogs that resemble pit bulls. Am Staffs have a quite large weight range. Averaging between 40 and 70 pounds, they are definitely on the larger size of the medium range. This is especially due to their muscular bodies. However, many Am Staffs fall in the lower part of the weight range, especially females. In addition, it is often easy to find dogs mixed with pit bull type dogs in a smaller size. In general, the Am Staff is a highly affectionate and energetic dog that makes a wonderful companion for active households. The Australian Cattle Dog is an active and intelligent dog breed that typically weighs between 35 to 50 pounds. This is a compact, muscular dog that is powerful and driven to work. The breed is curious yet loyal, making it an excellent companion. The Australian Shepherd is a very intelligent, high-energy dog breed that typically weighs between 40 to 65 pounds. This breed is agile and athletic and therefore well-suited to dog sports like disc and agility. Aussies are loyal and friendly dogs that make great companions for very active households. The Basset Hound is an easy-going dog with a unique appearance. Typically weighing 40 to 65 pounds, one can joke that much of the weight is skin and ears! Their short, crooked legs keep them low to the ground, but their long bodies add overall size. Bassets are energetic as puppies but tend to slow down in adulthood. Basset owners should be sure to keep the ears and coat clean as the breed is prone to ear infections and skin issues. Otherwise, these are great dogs that fit in well with quiet to moderately active households. The happy-go-lucky Beagle is a favorite among those who want a small to medium dog that is moderately active and sweet. Their 20 to 30 pound weight range makes them compact yet durable dogs that can go from couch potato to outdoor playmate in minutes. Just watch out for food around the house; most Beagles are food-obsessed vacuum cleaners! The Bearded Collie is a clever, outgoing dog that looks a bit like a smaller Old English Sheepdog. At a typical weight of 45 to 55 pounds, the Bearded is actually smaller than it looks. This breed's fluffy coat makes this dog look larger, but its frame is lean and agile. Owners of this breed will need to keep up with coat care: either daily brushing of the long coat or frequent haircuts to keep the coat short. As a herding breed, Beardies have plenty of energy and drive and will need regular exercise. The Border Collie may be best known as one of the world's smartest dog breeds. It is also an extremely high-energy dog breed. Weighing in at 30 to 55 pounds, this medium dog packs a lot of power into a compact body. If you have a lifestyle that allows you to keep your dog active and mentally engaged, then the Border Collie can be an ideal companion. Border Collies are loyal and affectionate companions when they lead an active lifestyle. Bored Border Collies can become destructive or even depressed. The Boykin Spaniel is a friendly, alert dog that makes an excellent bird dog and a relatively easygoing house pet. Typically weighing 25 to 40 pounds, this dog is a great size for flushing out game or simply cuddling on the couch. The Boykin also tends to love water and is a skilled swimmer. With regular exercise, this breed can be a relaxed household companion for all types of households. The Brittany is another compact Sporting dog that excels at hunting. This high-energy breed thrives on physical activity, whether is it hunting or a dog sport like agility. Keep your Brittany active and engaged and you will find that the breed is an upbeat, affectionate companion. This breed can get bored without enough activity and should live in an active home. The Bulldog (sometimes called the English Bulldog) is a short, stout, muscular dog know for its short muzzle and tendency to snore. Young Bulldogs may have a ton of energy, but they usually slow down into adulthood. Though they are low to the ground, they weigh about 40 to 50 pounds, most of which is muscle. Bulldogs can make great companions but may require extra health care depending on genetics. Bulldogs often suffer from brachycephalic syndrome, orthopedic problems, skin issues, and more. However, they are lively and friendly dogs that make great companions. The Bull Terrier is a charming and playful "goofball" of a dog. They are short and stout, with large-boned, well-muscled bodies that make them weigh about 50 to 70 pounds. This breed often has bursts of energy and clownishness that make it entertaining to be around. Plenty of exercise and training are necessary to keep this breed from becoming restless and hyperactive. The Cardigan Welsh Corgi is one of two Corgis of medium size and similar traits. This breed is long bodied and low to the ground. The typical weight is 25 to 38 pounds. Cogis were built for herding but can be quite content as house pets. They will, however, need a moderate amount of exercise to stay happy and healthy. At 20 to 30 pounds, the Cocker Spaniel is on the smaller side of the medium range. These are versatile companions who enjoy playing and moderate exercise. With good socialization and training, the breed tends to get along well with kids. If the Cocker's coat is kept long, daily brushing is essential. Many owners choose to keep their coats trimmed short. Pay close attention to the ears in case an infection develops. Perhaps best known as the movie dog Lassie, the Collie has remained a relatively popular breed known for a regal grace, strong intelligence, and fierce devotion to its people. Collie owners need to brush the thick coat or keep it trimmed short. Exercise needs are moderate and training is usually relatively easy. The Collie is receptive to training and craves the presence of its owners. The Dalmatian is, of course, known for its distinctive spots. Many can be considered medium-sized dogs. However, the Dalmatian's weight range is 45 to 70 pounds, so its final size generally depends on the dog's breeding. The Dalmatian is generally smart and outgoing, but it may have a stubborn streak and a nervous side. Make sure to provide structured training and regular exercise. Boost confidence by reinforcing good behavior. Provide plenty of socialization so new situations will not cause excess stress. This tough bird dog is athletic and determined while hunting. At home, this is a friendly companion that aims to please. Springers need regular exercise and grooming to stay healthy. They are playful and truly enjoy spending time with the whole family. This breed does best in relatively active homes. At first glance, the Keeshond looks a lot like a large furball. In reality, the breed usually weighs 35 to 45 pounds, but all that hair makes the dog look larger. The Keeshond shares ancestry with the Pomeranian and Samoyed, which is easy to see based on the dog's appearance. Regular brushing of the coat is important to keep the Keeshond looking its best. A moderate amount of regular exercise is needed to keep the breed healthy. The Keeshond is outgoing, friendly, and can adapt well to most types of households. The Kerry Blue Terrier is large for a terrier, but at 30 to 40 pounds, it still falls into the medium-sized category. The breed is perhaps best known for its blue coat that comes in varying shades of blue/gray. The Kerry Blue Terrier is a smart and energetic dog that loves people. Basic regular exercise and training are enough to keep most happy. Coat care is essential. The Kerry Blue Terrier is suitable for many types of households. The Miniature American Shepherd is essentially a smaller version of the Australian Shepherd. At 20 to 40 pounds, the breed is still a surprisingly effective herder. This breed is intelligent and energetic. The Miniature American Shepherd is great for someone who wants a smart, active, affectionate dog like the Aussie, but in a smaller package. Similar to its larger relative, the Cardigan, the Pembroke Welsh Corgi is long-bodied with short legs and distinctive pointy ears. The breed is quite athletic and powerful for its size, which is typically 20 to 30 pounds. While the breed is excellent as a herding dog, it also makes a loyal and affectionate companion for many types of homes. The Soft Coated Wheaten Terrier is known for its soft coat and joyful demeanor. The breed sheds very little but needs frequent care to prevent tangles and mats. Training is essential to keep the stubborn terrier streak under control. Fortunately, the breed can learn fairly easily. This energetic dog needs regular exercise. Overall, Wheatens are smart, friendly, and loyal dogs that can adapt well to all kinds of households. The Staffordshire Bull Terrier is sometimes mistaken for a small pit bull type dog (like the Am Staff). However, this is an entirely separate breed. The round, muscular body, short legs, and large head make the breed look tough despite a typical weight range of 24 to 38 pounds. This is a courageous and determined dog breed that is more powerful than its size indicates. However, the breed's soft side is quite endearing. Staffies are loyal and affectionate to their families and have a special love for children. In fact, they have often been referred to as "nanny dogs." The brave and enthusiastic Standard Schnauzer is truly medium-sized. At 30 to 50 pounds, the breed is larger than the miniature Schnauzer and smaller than the Giant Schnauzer, yet it possesses many qualities from both. Historically a farm dog, the Standard Schnauzer now makes an excellent watchdog and athletic companion. Despite its strong-willed side, the breed is loyal and smart. Whippets might be best known for looking like Greyhounds. Weighing about 25 to 40 pounds, they are smaller than Greyhounds but no more delicate. While the tiny Italian Greyhound can be fragile, Whippets are more solid without taking on the height of the Greyhound. The Whippet is incredibly fast and athletic. These friendly and affectionate dogs make great companions as long as you don't mind them chasing after anything that moves. The breed requires little grooming but a fair amount of exercise. Fortunately, the breed adapts well to most households.